This Photoshop tutorial shows how to create a stone texture and how to use this same texture to create a stone wall. 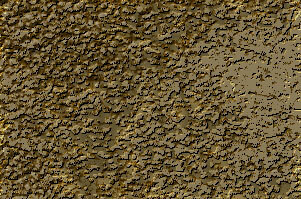 The same texture can also be used as to create a stone floor. The main goal of this tutorial is to teach you how to create a texture from scratch without using any photographs. Open a new file in Photoshop. I selected a size of 600x400 because it's easier for me to write a tutorial with this small size, but you can select any larger size you want. Select the Paint Bucket tool in the tool bar and click once inside your document window to fill the background layer with this dark brown color. 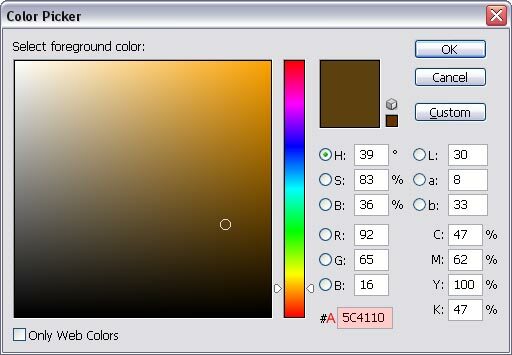 Select the color value 8B7B5A (medium brown) and click on OK. The layer mask attached to this layer should be active right now (double border). Click on it once if it doesn't have this double border. Press the letter D on your keyboard to make the fore- and background color black and white. Important: The above image is only part of the original image. The reason why I'm not showing you the original image that we're working on is because images like these (textures) tend to compress rather poor when saved with Jpeg. An image this size saved with average Jpeg compression is about 30KB. If I would have used the original image then it would have been 115KB. So in order to save bandwidth and to make pages load faster I will only show a small part of the original image. This time we select the color value DFC184 (beige/orange). Click on OK. Gloss Contour: click on the black triangle in the marked area to change select the setting shown here. Normally there shouldn't be any need to change the other values as long as your Photoshop version is using the same default values (double check). Make sure that you don't click on OK yet after you've entered the correct values. Contour: click on the black triangle in the marked area to change select the setting shown here. You can now click on OK to close the Layer Style window. 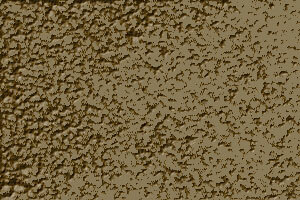 We have just created the texture that we're going to use for our wall. With the top layer being the active layer, add a new layer by clicking on the Create a new layer icon at the bottom of your layers palette. Press Ctrl + Alt + Shift + E (Command + Option + Shift + E on the Mac) to merge all visible layers on the current layer. Double click on the layer's name in the layers palette and rename it to Wall Background. Double click on the layer's name in the layers palette and rename it to Texture . Click once on the eye icon in front of this layer to make it invisible. Click once on the thumbnail of the Wall Background layer to make it the active layer.